The dominant story about the job market is no longer the nation’s 11.3 million unemployed people or the painfully slow pace of hiring. It’s the growing portion of the working-age population that has dropped out of the labor force and isn’t even looking for a job. The jobs report for August seemed upbeat on the surface, since the unemployment rate dropped by one-tenth of a point to 7.3%. But analysts have been quick to point out that the unemployment rate fell because the number of people looking for work -- part of the numerator in the equation used to determine the unemployment rate -- declined. That’s usually a sign of an ailing economy, not a recovering one. The labor force participation rate is now at the lowest level since 1978 -- before women flooded into the workforce, pushing the participation rate to record highs. So who, exactly, is dropping out of the labor force? It’s well-known that male-dominated industries such as manufacturing and construction have endured painful and probably permanent shrinkage, which suggests a lot of middle-aged, blue-collar men are now sitting on the sidelines. Some analysts feel extended unemployment insurance has given a lot of laid-off workers a stronger incentive to collect a government check than look for a job. Then there are critics of the “47 percent” (now the 43 percent) of adult Americans who pay no income tax yet somehow eke out a living. The biggest drop-off has come among young workers. The recession and subsequent weak recovery have cut sharply into opportunities for entry-level workers, in virtually all industries. Some simply can’t find work. Others have chosen to go to college or graduate school instead of looking for a job. The job woes of this “Millennial” generation have garnered plenty of attention. More twenty-somethings live with their parents these days, which has torpedoed the rate of new-household formation and left homebuilders and automakers anxiously wondering who will buy their products in five or 10 years. The amount of student debt has mushroomed, as many students pay for college with readily available (and often federally backed) loans. Many grads are starting their careers deep in the hole, since they can’t find jobs that pay enough to cover their loan payments while still allowing them to live independently. Those are legitimate problems, but it’s also possible that a better educated workforce will pay dividends in a few years' time. College enrollment rates grew at a moderate pace until 1999, then began to increase more sharply. The recession lured even more people into higher ed, including a lot of older adults who attended community college to hone new skills. And sure enough, enrollment rates have begun to drift downward now that more young people sense an improving job market and feel they’re more likely to find work. That education bulge could give the economy a boost in the future, much as the G.I. Bill did in the 1950s and ‘60s. Consulting firm McKinsey, for instance, predicts that by 2020, the U.S. economy will face a shortage of about 1.5 million college-educated workers. If so, demand (and pay) will rise for those who do have a degree, turning at least some of today’s workforce dropouts into tomorrow’s productive workers. Also, more students have been choosing math and science majors, which seem more likely to lead to profitable work and perhaps a more innovative economy. It also stands to reason that some dropouts in other age brackets will return to the workforce when, or perhaps if, the job market improves enough to make it worth their while. Some dropouts are still working plenty hard as stay-at-home parents or caregivers to their own elderly parents, having made a pragmatic decision that it’s not worth the trouble to work in an iffy economy while paying someone else to help with their family obligations. 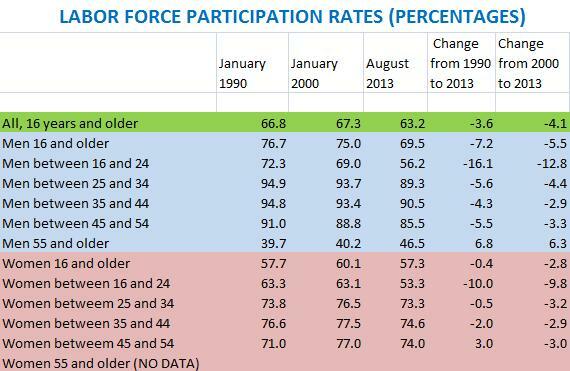 Also notable is that the participation rate for men over 55 has gone up considerably. That makes sense, since those close to retirement may have the greatest need to pad their savings. Established workers are also in the best position to simply stay in their jobs instead of retiring, compared with younger workers who haven’t even found a job in the first place. If older workers gradually improve their finances and once again begin to retire earlier, that could open the door for younger workers to move into their jobs, which might improve hiring down the entire employment food chain. The real question about labor force dropouts is whether there would still be an elevated number if the economy were as productive today as it was in the late 1990s or even the late 1980s. It might make sense to drop out when the rewards for your work are fairly low. But if workers leave even when the rewards of work go up, then something fundamental has changed. That could end up being the biggest threat to the nation’s future prosperity.